Do you forget everything after a yoga class when practicing at home? 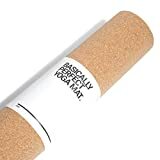 Then check out this cool new Instructional Cork Yoga Mat with a built-in cheat sheet. 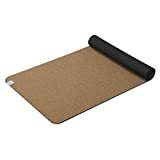 This unique yoga mat is constructed from cork that is soft, lightweight, hypoallergenic, and naturally anti-microbial and has 59 stretches and 60 poses printed on the surface for easy reference. Hmm, I wonder why the Twister game has never released an official yoga mat?